Polinizaciones started simply in 2007, as an initiative of an autonomous pollinator of the Beehive Collective to distribute Plan Colombia posters to communities engaged in land defense and directly impacted by the USA´s military intervention in the region as part of the “War on Drugs.” Since then, Polinizaciones has evolved and metamorphosed into a grassroots network of cultural workers and communicators that use Beehive Collective graphics, street theater, photo & video, murals, social cartography and other arts-based strategies in the promoting a culture of resistance. Polinizaciones started simply in 2007, as an initiative of an autonomous pollinator of the Beehive Collective to distribute Plan Colombia posters to communities engaged in land defense and directly impacted by the USA´s military intervention in the region as part of the “War on Drugs.” Since then, Polinizaciones has evolved and metamorphosed into a grassroots network of cultural workers and communicators that use Beehive Collective graphics, street theater, photo & video, murals, social cartography and other arts-based strategies in the promoting a culture of resistance, struggle and liberation in the defense of Mother Earth and the self-determination of indigenous, afro-descendent, peasant and marginalized urban communities impacted by resource extraction industries. On April 16th, 2004, right-wing paramilitaries of the Auto-Defense Forces of Colombia (AUC), under the command of Jorge 40, massacred 13 indigenous Wayuu women and children in the community of Bahia Portete, in La Guajira Peninsula in northern Colombia and displacing over 600 to Venezuela. While at first many believed that the massacre was connected to the Cerrejon coal mine, whose port of export remains near Bahia Portete, last year Colombian President Jose Manuel Santos announced the creation of the latest National Natural Park exactly in the place of the massacre. The new “National Park of Bahia Portete” confirms that tourism and green economy interests in the region have benefited from the violent displacement of the local Wayuu people. In November 2006, a survivor of the massacre was on the first of numerous speaking tours in the USA these heinous acts and demanding justice and the right of a safe return for the displaced. One stop of this tour was at the School of the Americas Watch (SOAW) Vigil, held at the entrance of Fort Benning, Georgia. At this vigil the survivor interacted with the Beehive Design Collective invited an autonomous pollinator of Colombian origin, Entre Aguas, to accompany the Yanama (communal-collective work in the Wayuunaiki language) held every April in Bahia Portete since the massacre occurred. The following year that Bee would move to Colombia and participated in organizing the 3rd and 4th Yanamas, which brought together delegates from across Colombia and the world to accompany the survivors so they could return to mourn their dead in the Clan burial ground, and to verify the continued danger of the situation in La Guajira, which to this day does not allow the displaced to return. Apart from assisting the process of the Yanama, Entre Aguas found themselves with a lot of free time while living in the Colombian capitol of Bogotá, and started networking with different local processes. The first story-telling was held at the Centro Cultural Libertario (CCL). The incorrect assumption that Colombian activists would already know more than a sort-of foreigner about the realities of the US intervention in the region, meant that instead of the traditional story-telling, Entre Aguas just explained the origins, process and history of the Beehive Collective. Quickly it became apparent that actually most people, even those involved in social movements, knew very little about these policies and the Plan Colombia graphic campaign as an educational tool was in great need. Little by little word of mouth started to spread about free workshops explaining US intervention in Colombia and requests started coming in from all over Bogota. Different community spaces like the CCL, CreAcción Espacios, the Vivo Arte Festival and the main campus of the National University became main stays of the buzzings of Entre Aguas as well as new Colombian pollinators, who were so taken aback by the politically-charged graphics that a single Plan Colombia cloth banner was shared and moved all over the place within community spaces, schools, and universities, and many paper poster versions of the graphic were distributed wherever these pollinations took place. Over time, the limited scope of presenting the graphic and leaving posters became one-sided and the pollinators began to diversify the approach. The first exercise was in south Bogota, in infamous district of the city, Ciudad Bolivar. Within the neighborhood of Juan Pablo II, the child survivors of the “social cleansing” killings of the AUC of the late 1990s and early 2000s created a youth community space called Semillas Creativas (Creative Seeds), which houses a two classroom preschool, a community kitchen, community library, recording studio for local musicians, silk screen and photo lab. 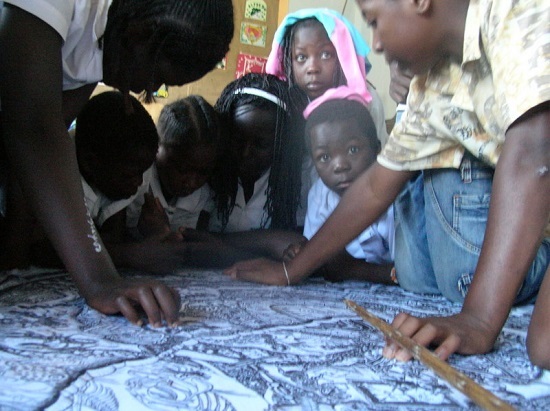 During a series of workshops, the bees presented both the Plan Colombia and the Free Trade Area of the Americas (FTAA) graphics, followed by a drawing session where the children drew the images that they liked the most from the graphics, which were later transferred onto silk screens and printed on clothes. The final day was spent silk-screening all of the children´s and neighbor´s clothes, followed in the evening by a community stew that was shared with everyone, performances from local hip-hop and dance groups and a screening of the animated films, Vampires in Havana I & II. Just as the pollinators were beginning to grasp the potential for how Beehive graphics and art projects would serve as educational tools for communities in resistance within the city, word started to spread and the requests for sharing started to come in from all over Colombia. Around the end of 2007 the pollinators in Colombia began accumulating many pictures of the different spaces they visited, and decided to create a blog to share short briefs and pictures of their experiences in these different spaces. The blog helped propel this available resource to many more interested communities as well as keep our North American pollinator cousins informed of how far the Beehive graphics were traveling. In the first couple of months of 2008 the first regional tour was held in the southwest departments of Cauca and Valle del Cauca. It was the first of many times that the graphics would make rounds through the indigenous Nasa and Misak communities in Cauca, community spaces in the cities of Cali and Popayan as well as the University of Cauca and the University of Valle. In Cauca the Polinizaciones tour connected with the Regional Indigenous Council of Cauca´s (CRIC) Education program and worked alongside the teachers at both campuses of the Center of Bilingual and Intercultural Education and Formation (CEFIC), as well as the education and communication programs of the Misak Nation, to discuss how a graphic based resource could be easily appropriated as part of the schools´ curriculum and be used entirely in indigenous languages such as Nasa Yuwe of Namrik. Meanwhile the blog started to grow in content as the articles began to deepen and widen the information, not only about the workshops but also give more contexts of the territories and communities, as well as local conflicts occurring. Soon after completing the first tour the requests began to pour in and the planning of different tours started. The need for more cloth banners became apparent. During this time, two members from the Take Back the Land Movement (TBTL) in Miami, FL, USA expressed interest in going to Colombia and meeting with leaders from Afro-Colombian land defense processes. Linking up with Process of Black Communities (PCN), a small tour visited both the Pacific-coast port city of Buenaventura and the Andean Palenque (Black Liberation community from colonial era origin) of La Toma in the municipality of Suarez in North Cauca. The tour consisted of Plan Colombia graphic storytellings and sharing between the leaders of TBTL and the different host communities. In Buenaventura it was seen firsthand how the country´s largest wealthiest port is also the home to some of the most impoverished Black communities, also stricken by State and paramilitary violence. It was also seen how the semi-rural marginal community of La Gloria struggles against losing an 80 Ha forest the community depends on do their subsistence from being razed for a proposed port expansion, as part of the continental development project known as the Regional South American Infrastructure Integration Initiative (IIRSA), serving a neoliberal resource extraction agenda. In La Toma the pollinators and TBTL leaders experienced a +400 year old community founded on Black Liberation, threatened by the Hydroelectric Salvajina Dam, the GMO pine plantations of the company Cartones de Colombia and the solicitation of company Anglo-Gold Ashanti to create an open pit gold. Bees and TBTL were lowered by rope and pulley deep into a 30 ft deep make shift gold mine where artisanal miners (no use of mercury or cyanide) labored as they have for hundreds of years. That year there was also a tour in Venezuela, which visited public universities, community and public spaces in communities within Caracas, Choroní and Maracaibo, as well as the first visit the indigenous Wayuu communities along the Socuy River in the Perijá mountains, organized within the Wayuu Organization Maikiralasalii (“Not for Sale” in the Wayuunaiki language). The Socuy River is located over the same massive bed of coal that is under the Guajira Peninsula and Perijá Mountains in both Colombia and Venezuela. Maikiralasalii has able to unite anarchists, true eco-socialists (not Chavista bureaucrats that self-identify as eco-socialists) and other anti-capitalist environmentalists in a movement that pressured President Hugo Chavez to retract his plans for coal mining expansion and prohibit the creation of new or expansion of existing coal mines. In 2008 Polinzaciones tours also visited Colombian communities in Bucaramanga, Pamplona, Manizales, Cali, participated in the Medellin Social Forum and repeated an extended SW Colombia tour. The second SW tour returned to the Misak and Nasa communities from the first tour as well as the Afro-descendent communities of La Toma and La Gloria, where in addition to the Beehive story-tellings, social cartography exercises helped youth map their territories, focusing on strengths and weaknesses in land defense processes. This time other Nasa communities in Tierradentro were visited as well as indigenous Kokonuko communities in Cauca and Pasto communities in the department of Nariño. While on tour in September, over 40 community leaders were killed throughout Colombia, the majority of those being indigenous leaders in Cauca. On the 12th of October the Indigenous and Popular Minga (communal-collective work in the Quechua language) initiated with the CRIC blockading of the Pan-American Highway in La Maria, Piendamo, Cauca, that grew to a nationwide Indigenous -led popular uprising that culminated in over 100,000 indigenous people and allies in the main Bolivar Park of Bogota demanding an end to State violence and the right to self-determination of Indigenous Peoples from all over Colombia. The capacity of pollinators to maintain tours was exhausting and the need to base our efforts in local processes became important to strengthen these local land defense and liberation. While Beehive pollinators in North America have always freely supplied the efforts of Polinizaciones with an endless supply of posters that are mostly given for free to the communities that Polinizaciones collaborates with, the need for large cloth banners was and is always needed to be able to supply communities in resistance with educational materials that support the efforts of territory defense. 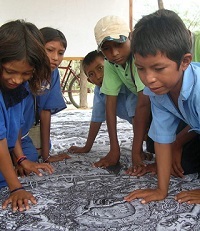 Through an Atlantic Coast North American tour in 2009, Polinizaciones was able to raise funds to print fourteen large cloth Plan Colombia banners that are currently located and used in different communities such as both campuses of the CEFIC, La Toma, La Gloria, the Pasto community of Potosí, and with Maikiralasalii. Around the same time the main pollinators in Colombia start to commit themselves to regional processes, putting tours on the back burner to focus on developing local processes. A pair of pollinators that were active in Cauca formed the Colectivo Colibrí (Hummingbird Collective), which in addition to using Beehive graphics, use puppets, street theater and literacy promotion to work with children in indigenous Misak and Nasa communities that are all facing the challenges associated with foreign companies trying to steal land for mining, mono crops and water privatization. They seek to further develop the understanding of these threats and create spaces were these children can participate and contribute to the defense of their territory. Another pollinator, Tjesi, who had already been working in the Amazonian region of Putumayo (the territory that gave birth to the Plan Colombia graphic in 2002) using Beehive graphics and film screenings, along with the participation of communities from the indigenous Inga, Kamsá, Cofán, Siona and Nasa Nations, formed the Intercultural Communication School of Putumayo, which continues to develop communication strategies such as maps, photography and audiovisual production, but also traditional communication modes (song, dance, paint, traditional medicines, rituals and ceremonies) to combat the threats these communities face in the region such as oil exploitation, mining, aerial fumigations of glyphosate, and the presence of all armed actors of Colombia´s armed internal conflict. Towards the end of 2008 then Colombia President Alvaro illegally handed over 9,500 Ha of land in the southwest department of Huila to the multinational company Endesa-Emgesa for the construction of the Quimbo Hydroelectric Project. One village impacted by the 8,500 Ha reservoir is the community of La Jagua, where some of Entre Aguas’ family is from. Since then the focus of Entre Aguas´ pollinations have been in their own region, impacted by the Quimbo Hydroelectric Project and the Emerald Energy oil-company through the local resistance of the Association of Affected Peoples of the Quimbo Hydroelectric Project (ASOQUIMBO). ASOQUIMBO is part of the Ríos Vivos (Living Rivers) Movement– Colombia, the social movements bring together Native, Afro-descendants, peasants, fisher and artisanal miner peoples in Colombia directly impacted by the construction of hydroelectric dams. None-the-less, even with personal priorities in Huila, the pollinations in Wayuu territory were and are still maintained. In the past few years Polinizaciones has been focused in Huila, Putumayo, La Guajira, Cauca and Nariño. Since the completion of The True Cost of Coal and Mesoamérica Resiste graphics the tool kit shared with communities has grown. 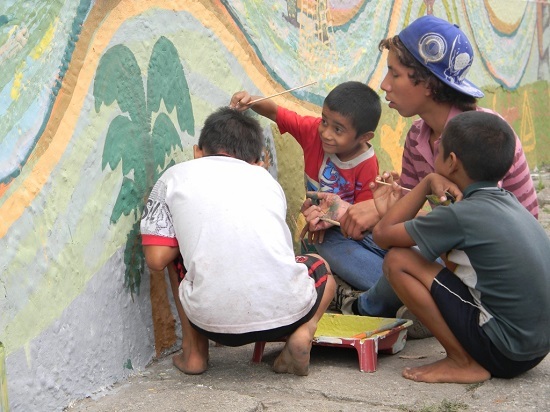 In 2013 Polinizaciones was part of the Ríos Vivos delegation and coordination of the V Gathering of the Latin American Network Against Dams (REDLAR) which was held in Retalteco, Petén, Guatemala, where murals were painted with local Ladino and Mayan youth reflecting on creating collective visual expressions rejecting the construction of hydroelectric dams along the Usumacinta River. In 2014 the Museum of Antioquia in Medellin invited Polinizaciones to an artist residency as part of the exposition called Contraexpediciones (Counterexpeditions), with peasant and indigenous Embera Chamí 8th and 9th graders of the school of San Bernardo of the Farallones of Citará. The residency consisted of two weeks of territorial hikes and design workshops resulting in 8 murals within the community as part of the local struggle against gold mining. Following the residency Polinizaciones was part of the opening panel of the exposition and the journey home to Huila was a Mesoamérica Resiste graphic campaign tour throughout different urban, peasant, and indigenous communities in the departments of Antioquia, Caldas, Valle del Cauca, North & Central Cauca and Huila. An observation that Polinizaciones has had within our path and process is that many allies come to communities and work with communities to develop communications products that create awareness about regional conflicts, but rarely support these communities with the knowledge and tools to tell their own stories. An example is how numerous people have visited the region of the Quimbo Hydroelectric Project or Putumayo, created films, photographs or articles about these struggles, but always from their view-point as an outsider. In recent years Polinizaciones has developed its own role as facilitators in these communities so that locals appropriate these tools and are able to tell their own stories. Since Chavez halted the coal extraction, the accompaniment of Polinizaciones with Maikiralasalii has been dedicated to reforestation and agro-ecology projects, audio-visual production and breeding and protection of local endangered species. Earlier this year Venezuelan President Nicolas Maduro announced the expanding of existing and creating new coal mines and also agreements with the Chinese-state owned company Sinohydro to build a thermal coal plant, railways and a port forcing Maikiralasalii to renew their struggle in a now more polarized, unsustainable, consumerist, petroleum-addicted Venezuela. On the Colombian side of La Guajira, Polinizaciones has just this year started to work closer with the Fuerza de Mujeres Wayuu (the Strength of Wayuu Woman), a social movement bringing together Wayuu woman and men who are organizing to strengthen the role of Wayuu people to exercise their autonomy and self-determination in the their own territory, Wounmainkat. Through our graphic story-tellings we have helped in consciousness-raising and emphasized the importance of land defense in the territory where Cerrejon continues to attempt to privatize different rivers such as the Rancheria River and the Bruno Arroyo, in order to get to beds of coal under these fluvial streams. Different Wayuu organizers and communicators have proposed to create a graphic campaign about the history and situation of Wounmainkat, to which we pollinators have responded that Wayuu artists, investigators, educators and organizers must be the ones to create such a tool if it is really to be useful for raising consciousness for Wayuu communities in the Wayuunaiki language. The role of Polinizaciones as outsiders is to accompany and advise the process as well as to facilitate and coordinate the technical aspects of the graphic campaign process, as well as fund-raising to print the maximum amount of posters possible. To facilitate this process we are currently pollinating The True Cost of Coal and Mesoamérica Resiste graphics throughout the entirety of Wounmainkat. For some years the pollinators of the Colectivo Colibrí have focused their work with the Misak communities near Silvia, Cauca on a variety of issues such as recuperating traditional agricultural techniques, literacy in Spanish, but also working with indigenous educators to develop methodologies and exercises to maintain the Namrik language. While maintaining the work with the Misak, the Colectivo Colibri has relocated to Nariño where they continue to develop the same type of work with indigenous Pasto, Quillacinga and peasant communities. The Intercultural Communication School of Putumayo has helped local communications collectives like the Cacique Tamaobioy Collective, made up of Inga and Kamsá youth in the Sibundoy Valley. This accompaniment has supported the struggle against mining companies with regional interests like Anglo-American and Anglo Gold Ashanti. An ongoing struggle by the communities in the Sibundoy Valley is against the San Francisco-Mocoa Highway, which would traverse a sacred territory vital for the gathering of medicinal plants. 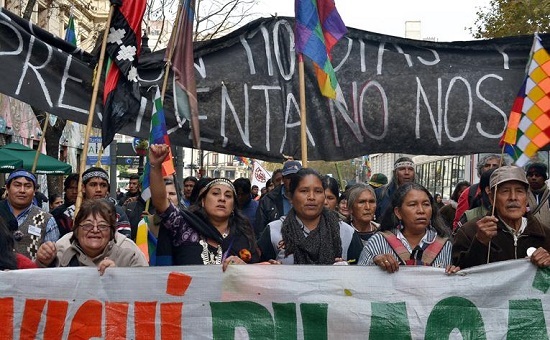 In 2012 the Intercultural Communications School played a vital role in the Putumayo Minga of Resistance that paralyzed the entire department as 14 Indigenous Nations, Afro-Colombians and peasants united to block the entrances roads connecting Putumayo with the rest of the country demanding greater respect for indigenous autonomy. In the lower Amazonian Plains, Intercultural Communication School of Putumayo has accompanied the efforts of Nasa communities in forcibly expelling oil companies from their territories, in the process receiving threats and assassination attempts from right-wing paramilitaries. In the outskirts of the city of Puerto Asis, the School is accompanying a displaced Siona community originally from the Putumayo River, displaced due to violence. The killings and displacements happening along the Putumayo River leave no doubt that the IIRSA project to channelize the river so that shipping barges can reach Puerto Asis is simply clearing the region to facilitate this project. 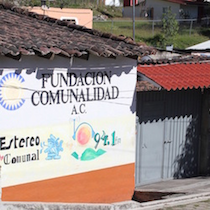 In the Province of Sucumbios in Ecuador, the School is beginning to help specific Cofán communities along the San Miguel River to develop their own educational materials and curriculum who under Ecuadorian law must send their children to schools that are not guaranteeing teachers fluent in the A’ingae language or a curriculum relevant to their world view, resulting in an accelerated assimilation into mainstream, Spanish-speaking Amazonian-mestizo culture. Finally in Huila in the community of La Jagua, Polinizaciones has helped foster a collective process led by youth and community mothers known as Decolonizing La Jagua. 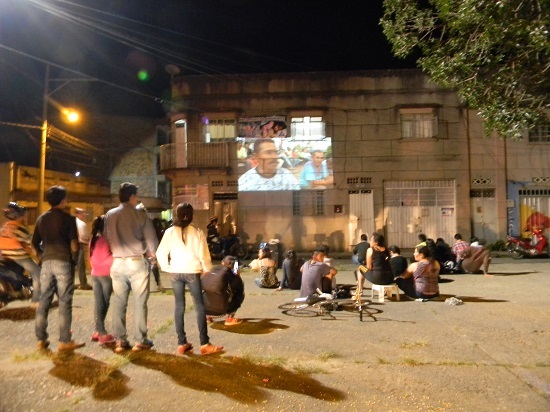 In addition to participating in the regional dam resistance as part of ASOQUIMBO, Polinizaciones has assisted in film screenings with discussions, territorial hikes, mural painting, invisible street theater, a community-led biodiversity photography census (through the online wildlife photography platform, Project Noah), and exchanges with other land defense movements in Colombia. This process has developed a self-reflective and critical process that examines issues of identity and culture within a population Native to their territory but overwhelmingly Catholic and peasant, not indigenous self-identified. Through these constant efforts, Polinizaciones since 2011 has been an integral part of the communications team of ASOQUIMBO, participating in road blockades, land liberations, and most recently has become part of the national coordination of the Ríos Vivos Movement. In 2013 Colombian President Juan Manuel Santos announced the agreement between the Colombian State entity CORMAGDALENA and the Chinese state-owned company HydroChina to completely privatize the Magdalena or Yuma River, for the purpose of hydroelectric energy generation (a total of 17 hydroelectric dams) and dredging to permit shipping barges to go upriver. As a result of this extended threat, Polinizaciones with Decolonizing La Jagua as part of the Ríos Vivos Movement has expanded to begin work with youth in other communities in Huila such as el Pital and Oporapa, where other dams and fracking projects have been announced. In 2014 Decolonizing La Jagua, with support of artivist Carolina Caycedo, led a 5 month arts-education and public action process which offered classes in dance, theater, performance and puppetry in the communities of La Jagua, Oporapa, El Agrado, El Pital and Gigante, culminating in eight direct actions in rural and urban locales; including bridge take-overs, mural paintings, theater performances, and audio-visual productions, all focused on land defense. This Fall Polinizaciones and the Ríos Vivos Movement will be returning to Turtle Island (North America) with the “Pollinating Rios Vivos” tour to build relations of mutual aid and exchange with other communities in land defense struggles as well as fund-raise for the upcoming processes of land defense. Between October 2015 and January 2016 Polinizaciones will be traveling down the Pacific Coast, later throughout Florida, and tentatively waiting to see the possibility of confirming a short mid-Atlantic tour as well. On this tour there are two main priorities. The first is to meet, share and create relations of mutual aid and solidarity with Native and other land defense struggles against dams, oil, mining and other extraction interests. The second is to be able to share these experiences in community spaces such a universities, community centers, libraries and other spaces that are also interested in creating relations of solidarity, offering financial support for upcoming projects. Starting in 2016 we will be continuing the “Pollinating Rios Vivos” tour but now within territories of Ríos Vivos Colombia. For two years we will be visiting all the river basins that are part of the movement; the Upper Yuma & Colombian Massif (Huila), the Upper Cauca (Cauca), the Sinú (Cordoba), the Cauca Canyon (Antioquia) and the Sogamoso and Fonce Rivers (Santander). This two-year territorial journey through dam-impacted communities that have organized and resisted has two purposes as well. The first purpose of this journey is to help deepen understanding and analysis of local members of the movement through graphic campaign workshops and other education processes, developing community led biodiversity censuses, and supporting these land defenders in the development and use of different artistic direct actions as strategies of land defense. The second component is that this journey through the regional movements that make up the Rios Vivos Movement-Colombia will serve as the preliminary first-hand research for creation of a graphic campaign of the Ríos Vivos Movement. The creation of this graphic campaign was collectively decided upon during the 3rd Political School of the Ríos Vivos Movement earlier this year. Rios Vivos has decided that the story of our resistance, the destruction of our territories, and our struggle to remain in our regions as the true and only guardians and caretakers of our territories is a story that needs to be told graphically, to strengthen our movement as well as to tell our story to others. This process will be undertaken and led by the Ríos Vivos Movement and allies within Colombia who also are impacted, directly or indirectly, by the destruction of territories through the damming of our rivers. We are giving ourselves a timeline of five years for the research and subsequent creation of this graphic campaign, which will be collectively reviewed twice a year by the Movement´s political school, in order to horizontally guide its creation as an educational tool by and for our communities in resistance and struggle for the liberation of our rivers and all of Mother Earth. As if this is not enough, during this time we will not be abandoning the processes we accompany in Putumayo and Wounmainkat – they will be part of this initial two-year journey even though they will not be part of the Ríos Vivos Movement graphic campaign. Within Putumayo we will continue to accompany the educational processes and development of materials and curriculum in the Siona, Cofán and Nasa communities. 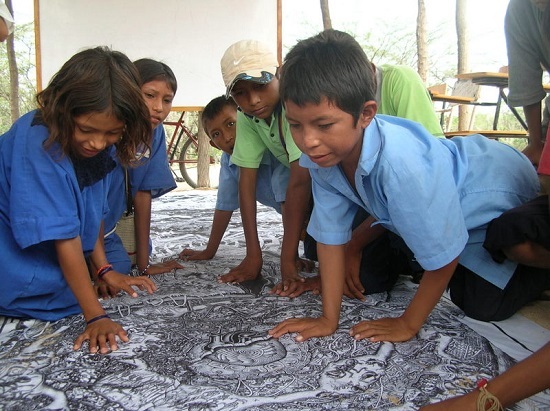 In the Wayuu territory (Colombia & Venezuela) will also partake in extended portions of the journey, with the slightly different aspect of assisting and fomenting of a Wayuu-created graphic campaign about Wounmainkat, and the added component of helping accompany processes of recuperation of traditional Wayuu dry lands agriculture. For this last portion we are searching for preferably Native dry land agriculturists who are interested in sharing knowledge and building relations of mutual aid with different Wayuu communities impacted by coal mining in the implementation and recuperation of traditional agriculture. – Invite us to speak and share with your community. – Money: unfortunately capitalism has not ended and we need money for direct actions and research journey. – Donate materials: Digital cameras, computers, external disc drives, audio recorders, and carrying cases.